So today… Announcements, followed by the Chi-Dog of the Day. 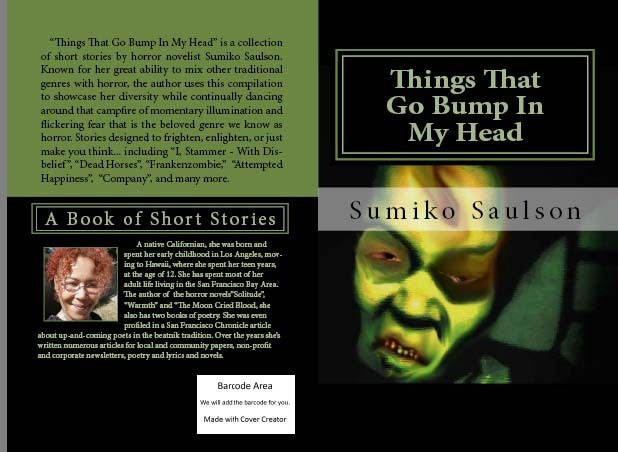 The first announcement is that I am coming out with a book of Short Stories, just in time for your Christmas Shopping Needs, called “Things That Go Bump In My Head” (which, not coincidentally, is the name of my blog.). It is going to contain a number of my short stories, one or two of which you will have seen on this very blog in a sanitized, PG rated version, and several of which will be entirely new to you. You can expect me to repeatedly announce this here and elsewhere. The second announcement is that as a promotion, I’ve put one of the short stories, “Frankenzombie” (coincidentally – or not so coincidentally, the same one that uses the artwork I already used for the anthology) is available until July 13th for only $1.64 USD with the Lulu Code “CAUGHT”. So use that “CAUGHT” code and check out this short story, get a taste of what’s to come in December, and help me turn a profit today. ~ by Sumiko Saulson on July 11, 2012.